This property consists of 61 single- and 134 double-apartment houses; rental, 1s. 6d. and 2s. 3d. per week, exclusive of rates. This property is old and dilapidated, and otherwise typical of the ordinary miners' row, many of the houses having flag floors. For some time past the county authorities have been pressing the owner to have the sanitation of the place improved, but with little effect. Built 1924 by Shotts Iron Co.
1. I reside at Harthill, Lanarkshire, having been employed as district miners' agent since August 1912. Previous to that I resided at Bellshill, and was elected to the Parish Council and School Board of Bothwell Parish. Harthill is a mining district, and inhabited almost wholly by miners and their families. 2. The weekly wage will vary from 15s. to 40s. The average weekly wage is about 30s. The reason of the variation is that the coal seams are thin and principally "cut " or gotten by machine, and breakdowns are continually taking place, either the cable breaking or a lack of electric current, or perhaps falls from the roof causing the miners to lose time. In some collieries the trade is principally household coal, and work is irregular in the summer. 3. In Harthill Village we have 452 dwelling-houses ; of this number 150 are owned by colliery companies. The Coltness Iron and Coal Company own 122. The stone-built houses are 5s. every two weeks, brick houses 4s. 6d. for two weeks. This rent includes taxes, £6, 10s. and £5, 17s. per year. 4. There are two-apartment houses, but the room is very small, one storey, erected over thirty years ago ; no damp-proof course; plastered on solid; wooden floors, some ventilated ; and western walls damp. 5. Overcrowding is common where lodgers are not kept. In quite a number of cases you get families living in both room and kitchen, although the tenants of the room must pass through the kitchen, as there is only one door, no back door. 6. There are no washhouses, but coal-cellars are provided. Gravitation water is supplied by standpipes in the street, and refuse water is emptied in a surface channel about 6 feet from the door. 7. Dry-closets, with open ash-pit, serve 122 houses, and seventy persons for each closet. This form of closet is not adapted for women or children ; the women have to make other arrangements, and the children mess about the side of the houses. The Colliery Company employ an old man to keep the place clean ; under the circumstances this simply means scraping up. 8. 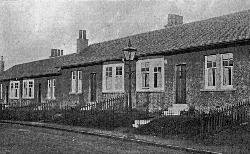 The other houses are leased by the United Colliery Company, or privately owned. A number of the houses are clearly uninhabitable and grossly overcrowded, families living in the garret. There are open middens in the back-court, and sewage runs into the open field. 9. Very few of the miners own their houses, but where they have been enabled to erect a house it is well kept. 10. My attention was drawn some weeks ago to the miners' row of North Rigg, owned by the United Collieries, Limited. There are ten houses of one apartment, and thirty-four of two apartments; rent 5s. 6d. every two weeks, or £7, 3s. per annum. 11. I found these houses in a most dilapidated condition : no water conductors on roofs, making walls damp ; slates off; water coming through the ceiling when it rained ; you could see through holes in the walls from one house to another; this, with plaster falling off, in addition to the usual insanitary conditions prevailing at the worst type of miners' rows, made home-life almost impossible. No washhouse, no coal-cellars, coal kept below bed. 12. I made complaint to Dr Wilson, the Public Health Officer for the County of Lanark, and he assures me that the Colliery Company will now put the houses in a habitable condition. 13. These houses are built of brick and erected about forty years ago, and are owned or leased by Mr Forrest. There are about 170 dwelling-houses erected in blocks, and they are on the Valuation Roll at £60, 14s. each. 14. According to the Police Census there are about six persons to each house. I am very doubtful if the lodgers have been included ; keeping lodgers is quite common, and in some cases rooms are let. I am of opinion that overcrowding is the result. 15. The back walls of these houses are embedded, and in some cases the floors are below the level of the back ground. The walls are damp, and the plaster is kept on by the paper the tenants put on. 16. The rent is 12s. per four weeks ; £7, 16s. per year for the Coal Row, and 13s. 8d. every four weeks, or £8, 17s. 8d. per year for the Stone Row (exclusive of rates). 17. There are no washhouses ; washing must be done in the kitchen. There are about seventy-two persons to each privy closet. 18. The county authorities have been pressing for an improvement in the sanitary conditions  improved closets and sinks to take away the refuse water. As a result of this pressure notice to quit was served on every tenant in April of present year. Whilst this threat has not been put into effect, it makes it very difficult to get tenants to complain, because no houses can be got in this district. 19. Taking a circle of 4 miles around Harthill, no houses can be had ; generally overcrowding prevails. If a young couple get married they have to reside in a room because of the scarcity of dwelling-houses of any kind. Private enterprise has failed to provide houses, and the public authority has done nothing. The Co-operative Society has provided about thirty houses of the tenement type. Whilst an improvement on some existing houses, they are not a very good type of dwelling-house. 20. Ground can be leased for £12 per acre, and there is plenty available. 21. 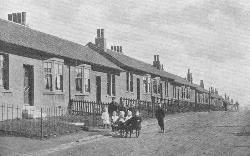 The houses provided by colliery companion are in blocks, about eight houses to each block - a closet and more blocks ; long rows ; very cheaply built. Dry-closets badly kept; in some cases doors are off. No washhouses ; in great many coal kept below the bed. No scullery ; water supplied by a stand-pipe or pump, one for some twelve houses. Bleaching greens are available, and gardens ; where the latter has been fenced off, they are cultivated. 22. Very little repairing is done, or if done has been delayed too long. There is a surface channel some 6 feet from the door to take away refuse water. The villages are scavenged at the owners' expense ; no lighting ; no supervision. Tenants have to complain. The rent deducted weekly or fortnightly according to pay. 23. I do not favour single houses. I think the minimum ought to be room and kitchen, scullery and closet (water) for each house. I don't think closets will be kept properly unless you have one for each house, as in this way you are able to fix responsibility. One bad or careless tenant will spoil the closet for a whole block. 24. We ought to erect dwelling-houses in blocks of two room and kitchen, scullery, bathroom, and closet below ; and two bedrooms on top, with garden and green enclosed for each tenant. 25. I should think the miner generally could pay £9per year if he got suitable accommodation; but where he has a family of sons working he could pay more, of course getting more accommodation. 26. Houses might be erected in a way that this rent might give a return, but colliery owners, with a limited field of coal, might find it difficult to make it pay, although if erected by some public authority there would be a better chance, as in event of one colliery going done, some other would begin. 27. Tenants residing in a house owned by a colliery company lack security of tenure, as they are compelled to quit the house if they leave the employment. The result is that tenants don't always take the interest in the house they might do if the tenure were more permanent. 28. As regards gardens, these as a rule are not fenced by the owners ; the tenant won't erect fences ; and the preparation of the soil and getting of trees or flowers becomes a difficulty. Where tenants have security I have known them to prepare soil and erect hothouses. 29. Messrs Barr & Thornton have erected some blocks of dwellings, consisting of room, kitchen, scullery, and closet for each house at Knowiton near Fauldhouse. This class of house is an improvement on any in this district, and if better arranged would have been more satisfactory. Some colliery owners cannot get away from the long row system. 30. There are no baths at collieries about here, although men as a rule travel long distances to the mines, coming home wet, as workings in this part of the country are mostly wet, and if they don't get wet at work, in wet weather they are soaked before they reach home, where all the drying has to be done. 31. I had considerable experience in trying to get sanitary improvements carried out in Bellshill district, and a fair amount of success, but we met greatest opposition from large colliery employers, who seem to think the row with surface channel "or sheugh" about 4 feet from the door, and the open ash-pit, and dry-closet up against the room window were all the miner required. 32. I am inclined to think they use their influence with public bodies ; at least some of them don't seem to put the same pressure on big companies as they do on the private owner.